Every registered citizen who votes should have her ballot counted. This is not a controversial statement. Yet, for a variety of reasons, some voters arrive at the polls on Election Day only to be turned away when their names do not appear on the list of registered voters. Congress has attempted to correct this situation by including "fail-safe" or provisional voting requirements in the Help America Vote Act (HAVA) of 2002. States had the opportunity to adopt laws and procedures that maximized the chances for a provisional ballot cast by an eligible voter to count. The 2004 elections show, however, that states have taken very different paths in implementing provisional voting requirements. Consequently, the rates at which provisional ballots are counted vary widely from state to state -- from 96% counted in Alaska to only 6% counted in Delaware. These practices sometimes even vary widely within the state. 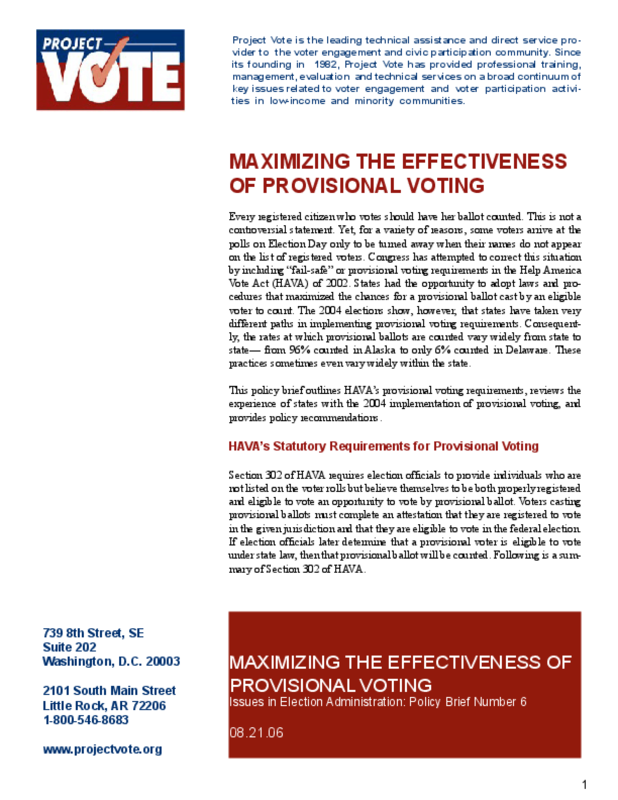 This policy brief outlines HAVA's provisional voting requirements, reviews the experience of states with the 2004 implementation of provisional voting, and provides policy recommendations. Copyright 2006 Project Vote. All rights reserved.